Financial markets are continuing to react to concerns surrounding the impact of avian influenza on the meat industry. As the number of outbreaks climb, shares in meat and poultry companies, including Pilgrim’s Pride Corp., Tyson Foods, Inc. and Sanderson Farms, Inc., decline. Other companies in the meat industry are facing similar dilemmas. 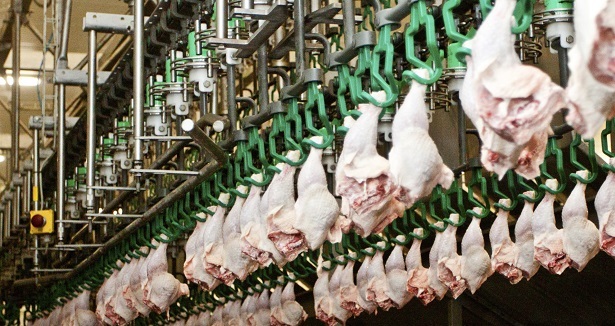 As a result, it has become increasingly important for raw meat processors to employ techniques that generate the highest yield of product. CEM Corporation has developed three unique systems for process control, each designed to improve yield while maintaining low user cost and ease of use. The ProFat Raw Meat Analyzer is a complete moisture, fat and protein solution for any raw meats, including blends. The MEAT Trac can analyze moisture and fat in both incoming raw meats and finished products. The Sprint Protein Analyzer can analyze any food product for true protein. Please visit the link below to learn more about CEM's line of raw meat processing systems. 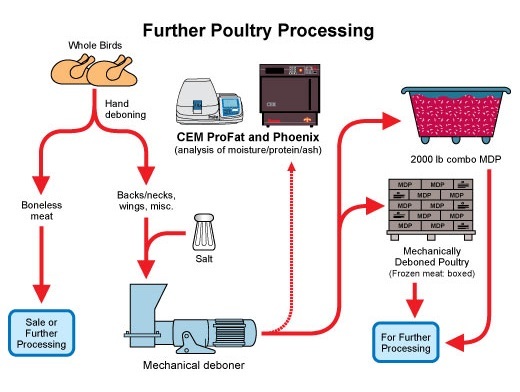 The diagram below shows the incorporation of the ProFat Raw Meat Analyzer, MEAT Trac and Sprint Protein Analyzer into raw meat processing systems. All three systems utilize official AOAC methods for meat products and data management systems to fulfill any auditing or LIMS demands. Click here to learn more.